Andy H: Mention 'chip' to me and I'll be at the front of the queue. You can imagine my surprise though when I discovered that the latest chip on my radar was in fact a writer and not a potato-based delight. Luckily Chip Zdarsky has proven to be a winner and Peter Parker: Spectacular Spider-Man has become a permanent fixture on my pull-list. This week issue #298 continues the 'Most Wanted' arc as Peter Parker finds himself locked up. 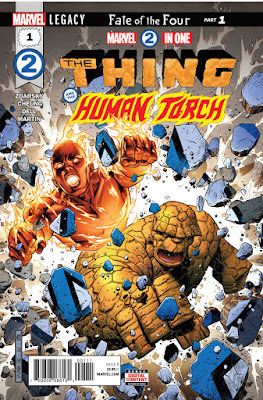 Another, hopefully, hot potato from Chip hits the shelves this week as Marvel Two-in-One #1 reunites Johnny Storm and Ben Grimm. Hoorah! Enticingly titled 'The Fate of the Four' you can't help wondering if this will lead to the return of a certain fantastic foursome but, before we get too sidetracked at what could be, we get to enjoy the Fantastic Two. Zdarsky has a great talent for dialogue and I can only imagine that this should be perfect for the banter between the Torch and the Thing. If you want an added incentive to give this a look, then how about Jim Cheung on art? Yes, true believers, this book has a real buzz about it. While I may not follow Hellboy on a regular basis, I have been known to dabble and Hellboy: Krampusnacht makes the shortlist as Adam Hughes provides the art for this one-off story written by Mike Mignola. Champions #15 concludes the 'Worlds Collide' crossover with Avengers and it's been a fun, nerve-jangling ride as Mark Waid has really put our heroes through the wringer. It's great to read a crossover that has one writer, and the quality has really shone through here. Over in the pages of Mighty Thor #702, Jason Aaron is also putting the heroes to the test as Mangog continues to cut a bloody path through Asgard. Phew! Some great reading to look forward to over the Christmas break. For now though, it's off to the local takeaway as for some reason I'm suddenly craving chips. Can't think why. Ho Ho Ho! Jo S: So, what will Santa be stuffing in my stocking this week, giving me a place to escape the turkey and in-laws? Well, there’s a little gang of comedy choices right there to start with. Christmas chuckles to be supplied (I hope) by Deadpool Vs. Old Man Logan #3 - the ongoing friction between these two is an limitless font of mirth - and by new series Quantum And Woody! from Valiant - I was tempted by the tale of sibling rivalry but the deal was obviously sealed with the addition of a goat sidekick. My regular Guardians Of The Galaxy and Peter Parker: Spectacular Spider-Man episodes generally give me a grin too, so there should be enough to drag me out of any Boxing Day doldrums. In contrast to that, the deeply dark and violent Sink hits issue #3 this week: the first two issues were distinctly different in content but I’m enjoying the style and the mystery of what exactly is going on in the darkness of this Glaswegian no-go-zone estate. I’m very excited about Tales Of Suspense #100: Black Widow’s hit list are being taken out one by one in mysterious and bloody circumstances and a devastated Hawkeye is on the case, forced to collaborate with the Winter Soldier - oof, awkward, much?! X-Men: Grand Design also caught my eye - this two-part history of the X-Men promises to be very well put together by Ed Piskor, creator of the Hip-Hop Family Tree, and looks ideal to help me brush up on all things X.